The Matthews Boat Company built this 46′ in 1935 and commissioned her in 1936. We are told that there were 4 of this model built. We are not sure how many are left of the 4 but we heard that there was one in Florida but it was neglected and sank sometime in the 1990’s. This may be the last one remaining (if anyone has any information on any of the other three, please let us know!). 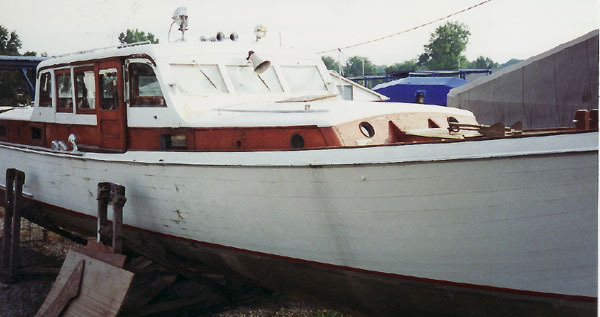 “Rocinante” came to our yard in 1977 with her new owner after spending her previous years in a boathouse in Sandusky. Just prior to the sale in 1977, a large amount planks were replaced. The owner was a regular at the boatyard throughout the year working on “Rocinante” maintaining brightwork and various carpentry projects. We were called on every so often to help him “catch up” with some work; in one winter we replaced some boards on the transom and some of the internal structure around it. The major project we worked on was the rebuilding of deck structure and cabinsides in the late 1980’s. You can read more about that project in our portfolio. The previous owner passed away in 1994 and “Rocinante” came into our hands a few years later. This boat has all the original hardware and the family of the previous owner went to great lengths to make sure we had all the parts of the boat that were in storage at the owner’s residence. We have kept her under cover since then while she awaits her next owner and subsequent restoration at our yard. This a serious restoration of a true classic will involve significant resources of the owner and our yard. If you are interested in this project, please contact us or stop by the yard!